Virtual laboratory experiments in physics is a serious learning aid and an interesting computer program with high-quality realistic graphics and a high level of interactivity. Its experimental assignments will not only help pupils to better understand physical processes and rules, but also teach them how to apply the acquired knowledge to practice. While conducting virtual laboratory experiments, a pupil will see for himself that research and creative activities are really fun to engage in. The multimedia features of the software make its usage quite similar to real lab work; therefore, the program can replace a practical experiment whenever the latter cannot be conducted (due to the absence of necessary equipment at school, pupil’s inability to attend classes, etc.). Besides, it can help pupils prepare for lab experiments with real equipment. Having been devised in view of a hands-on approach to education, these lab experiments enable pupils to engage in research, experimental and creative behavior. Measuring the size of small objects. Measuring weight with a balance scale. Measuring the volume of a solid object. Determining the density of a substance. Exploring equilibrium conditions for a lever. Measuring the uniformly accelerated motion. (The goal is to explore the main rules of the uniformly accelerated motion). Measuring the thread pendulum oscillation. 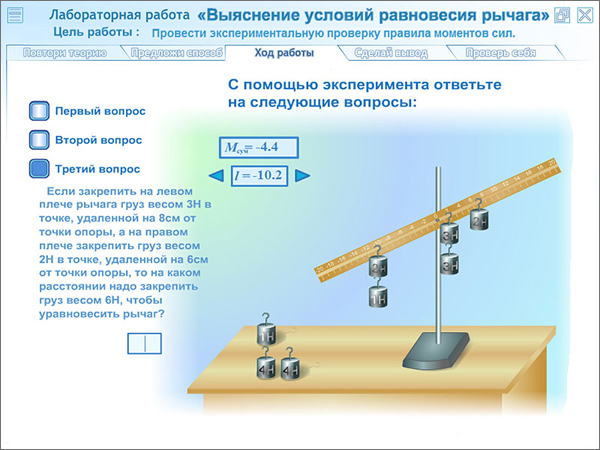 (The goal is to determine the dependence of the thread pendulum oscillation on its length). (The goal is to measure the specific heat of metals and to verify the heat balance equation). Exploring the qualities of a collecting lens. (The goal is to learn how to use a collecting lens and to verify the thin lens equation). Let’s review the theory. Here, pupils are advised to actualize their knowledge of the topic studied. This section contains definitions, laws, formulae, units of measurement, tables, graphs, and diagrams; sometimes a historical reference that broadens pupils’ horizons is provided. Suggest a method. A pupil is expected to answer a problem-based question (the text is typed on the keyboard). The equipment, which can help to solve the assigned task, is displayed in the right-hand window. A pupil can also compare her/his solution to the one presented in the program. Procedure. At this stage, the virtual lab experiment is conducted. All the assignments are divided into several stages. All the results are to be recorded in the table presented here. The Check Yourself stage allows pupils to conduct a virtual experiment with the help of the available equipment and to answer the questions (the answer is to be either chosen or typed on the keyboard). By monitoring the correctness of the pupil’s actions, the program allows her/him to check and evaluate her/his knowledge of the topic. 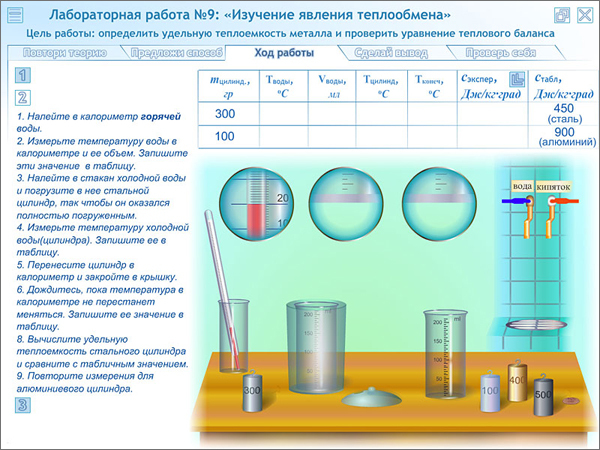 The results of the experiments are recorded in a special printable report. Virtual laboratory experiments in physics help teachers to apply hands-on methods of education, encourage pupils to engage in active cognitive behavior and develop independent work skills. if the educational institution lacks necessary equipment. if a pupil cannot attend classes. for self-education or for a supplementary study of a certain branch of physics. for forming work skills in operating real physical laboratory equipment. 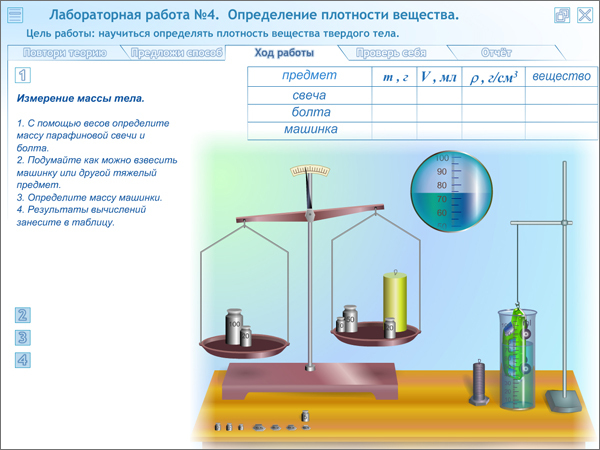 The features of this electronic learning aid suggest that it is used for practical training in physics. 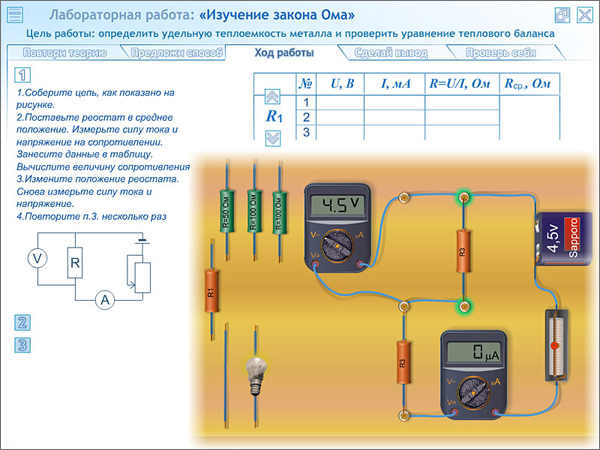 The use of the virtual lab materials by the teacher depends on circumstances and didactic goals of the course. If a classroom is equipped with enough computers, independent computer-assisted lab experiments can be conducted. If a classroom has just one computer, frontal lessons accompanied by demonstration of certain physical processes can be conducted. In the latter case, the software serves as an interactive visual aid. The program can be also used as a tutorial for solving experimental physical problems included in each lab experiment. This not only improves relevant skills, but also prepares pupils for a practical section of the exam. Pupils’ independent work with the software allows them to develop their own educational track; the answers to problems provided in the learning aid enable pupils to self-evaluate the acquired knowledge and make plans on how to modify the training course.